Today is Baptism of Jesus Sunday. According to the Gospel of Matthew, Jesus journeyed from his home in Nazareth to the Jordan, where John was baptizing. Jesus got in line, and when he got to the front of the line, John asked Jesus to baptize him. But, Jesus insisted on being baptized, so John buried him in the waters of the Jordan. When Jesus emerged from the water, the heavens opened, the Holy Spirit descended, and a voice from heaven declared: “This is my Son, the Beloved, with whom I am well pleased” (Matthew 3:13-17). In receiving this baptism, Jesus not only set an example, but his experience reminds us that when we are baptized we should expect to receive the gift of the Holy Spirit. This is the message that Peter delivered on the Day of Pentecost, and it’s the message we see revealed in the experience of Cornelius and his household. Later this morning we’ll have the opportunity to renew our baptismal vows, and in doing this we’ll reaffirm the gift of the Holy Spirit that seals the covenant relationship that exists between God and the body of Christ. The bowl filled with water sitting in front of the Lord’s Table this morning reminds us that Christian baptism is a baptism of water and the Spirit. The reading from Acts 10 is an excerpt from a larger story about how the Spirit led Peter to the house of Cornelius, so he could testify about Jesus and the mission of the church. According to Luke, Peter had a vision in which he was invited to eat forbidden foods. Peter resisted, but a voice from heaven declared that when God says something is clean, then it’s clean. That’s when Cornelius’ representatives knocked on his door. Being nudged by the Spirit, Peter followed these emissaries to the house of Cornelius, a Roman soldier who was also a friend of the Jewish community. Peter took this opportunity to share his testimony. He told them how he had just learned that God doesn’t show partiality. He told them that God welcomes everyone who worships God and does what is acceptable to God. What he learned from this vision is that God had called Israel to be a light in the world, and that ministry of Jesus was an extension of that calling. Tucked into this sermon is a word about how God anointed Jesus with the Spirit and power at his baptism, and that after this baptismal anointing Jesus began his preaching and healing tour, which eventually led to his death and then his resurrection. All that Peter was doing was following Jesus’ lead into new realms of mission, by sharing the good news that forgiveness of sins was available in the name of Jesus. In other words, he was commissioned to share the gospel message of reconciliation (2 Cor. 5:19). Just in case Peter and his companions weren’t quite ready to welcome Cornelius into the family, God intervened and added confirmation to the message. You see, sometimes it’s easier to put up walls than take them down. That’s because we get comfortable with our walls. So, what did God do? God poured out the Holy Spirit on Cornelius and his companions, and they all began to speak in other languages, offering praise to God, just like on the Day of Pentecost. Now it was clear. God doesn’t show partiality. When Peter saw this, he told his companions to get busy baptizing the Gentiles whom God had welcomed into the realm! Yes, if God tears down walls, who is Peter to withhold baptism, which is a sign of inclusion in the body of Christ? Next Sunday I will begin a sermon series that I’m titling “Eating with Jesus.” This sermon series is part of our current emphasis on the relationship of the Table and Mission. But before we get to the Table, we need to do some thinking about baptism. You see, there was a time, in the not too distant past, when most Christians assumed that baptism preceded communion. But, that assumption has given way to the idea of an open table. If this is our practice, then what happens to baptism? What role will it play in our lives together? This is an important question for Disciples to wrestle with, since we practice believer baptism, but invite people into membership whose baptisms differ from ours. I will confess that I have struggled with the baptism question. That may have a lot to do with my own experience. As many of you know, I was baptized as an infant in the Episcopal Church. Back then, baptism didn’t lead to the Table; Confirmation did. So, even though I was baptized, I couldn’t receive the bread and wine until I was Confirmed at the age of twelve. After I left the Episcopal Church, they instituted “First Communion,” but that raised questions about the meaning of Confirmation. During high school, after a conversion experience, I was rebaptized in a creek at camp. Even though baptism is supposed to be a once-in-life experience, I broke the rule. Of course, I didn’t know the rule at the time. I just needed to do something to seal my new found commitment to follow Jesus. No one, at that moment, connected baptism and communion. As to the matter of the Holy Spirit, I soon learned about a second baptism, the Baptism of the Holy Spirit—just like on the day of Pentecost. As you can see, I’ve covered the bases when it comes to baptism. That’s my story, all of which occurred before I ever became a Disciple. But, I’ve done a bit of reading on Disciple views of baptism. I even wrote the text for the Disciples’ baptism brochure. There are a couple of elements that are central to our practice of baptism. First and foremost, baptism follows a confession of faith in Jesus. Second, we baptize by immersion. Both Alexander Campbell and Barton Stone believed that this was the New Testament precedent, and they wanted to follow the New Testament order, especially as they found it revealed in the Book of Acts. Just like I couldn’t come to the Table until I was Confirmed in the Episcopal Church, most Disciples congregations, until recently, required their children to be baptized before they could come to the Table. That no longer holds true, especially since we practice an open table. While Campbell’s teaching on baptism could be rather mechanical, he wanted to lift up the importance of owning one’s relationship with God, as well as with the church. I affirm this commitment. In fact, that was supposed to be the purpose of Confirmation in the Episcopal Church. But is baptism a necessary requirement for coming to the Table? Over the next several weeks we’ll be exploring the question of whom Jesus invites to the Table. In the meantime, let’s return to the meaning of the baptismal waters. When we attend to the baptism of Cornelius, I think we can make a good case that Christian baptism has two elements—water and Spirit. In Acts 2, Peter suggested that baptism brought with it two things: forgiveness of sins and the gift of the Holy Spirit. In the first case, the matter of forgiveness, the water of baptism signifies the washing away of sin. While the baptismal waters are applied externally, they symbolize an inner washing. Then, there’s the matter of the Spirit. In almost every case in the New Testament, Baptism and the Spirit are linked. What is interesting here is that God poured out the Spirit on Cornelius and his household before baptism, which is a good reminder that we don’t control God’s actions. As we consider the meaning of our own baptisms, I’d like to suggest that baptism serves as an invitation to dive deeper into Christ. It’s not only a point of entry into the church. It’s a point of transformation. Paul uses the imagery of dying and rising with Jesus, writing: “Therefore we have been buried with him by baptism into death, so that, just as Christ was raised from the dead by the glory of the Father, so we too might walk in newness of life” (Rom. 6:4). On the day that the Spirit fell on Cornelius, he and his household began to walk in newness of life. The same is true for us. Not only do we walk in newness of life, but in baptism we receive the empowering presence of the Holy Spirit that sustains our call to ministry. This ministry is sustained when we gather at the Table as the body of Christ. As Keith Watkins writes in his book Patterns of Faith in a Table-Centered Church, which we will be reading as a congregation: “Here the bread is broken and the wine poured out so that all may eat and drink together in love. Here the church becomes again what it already is, the body of Christ” (p. 6). Picture Attribution: Bazile, Castera. Baptism of Jesus, from Art in the Christian Tradition, a project of the Vanderbilt Divinity Library, Nashville, TN. http://diglib.library.vanderbilt.edu/act-imagelink.pl?RC=54305 [retrieved January 7, 2017]. 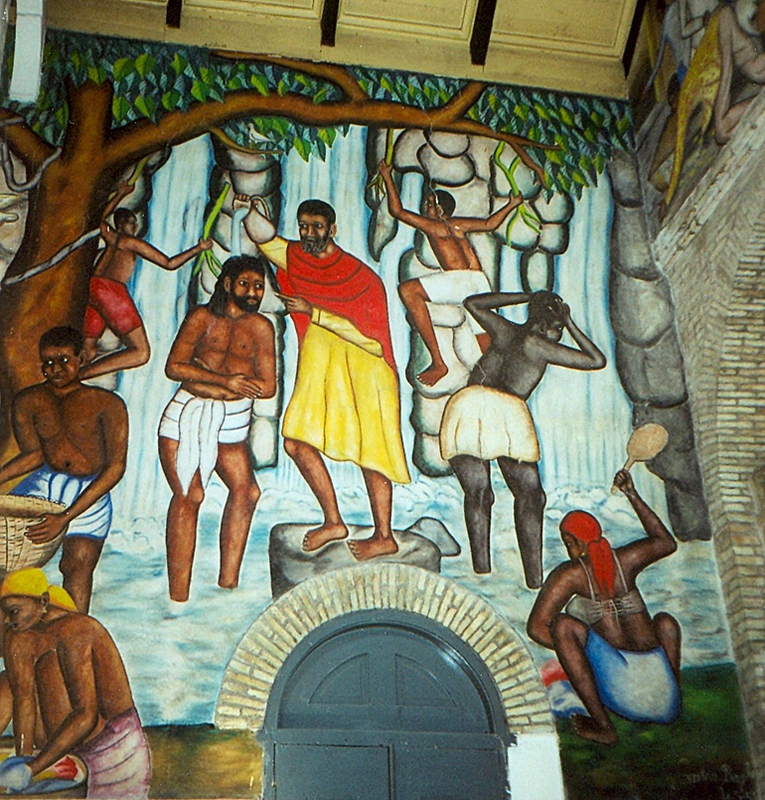 Original source: http://commons.wikimedia.org/wiki/File:PortAuPrinceMural.jpg.